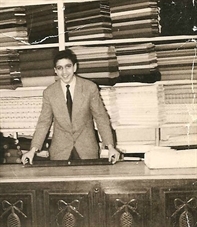 In 1965 a young entrepreneur, Mr. Fanis Deftereos, opens a small store in the center of Athens selling women and men’s apparel textiles. Being one of the few, the small shop soon enough becomes established in the fashion industry of Athens thanks to the sound knowledge of the subject, the high quality of its products and the personalized customer service. Today, having come into the hands of his daughter Palmina, F.Deftereos S.A. continues to operate under the same principles, in Kornarou St. near Syntagma square in the center of Athens, having expanded in the wholesale business both in Greece and abroad. Our aim is to promote women and men’s apparel fabrics of the highest quality, exhibiting our expertise and dedication, offering our customers the experience and the know-how via a friendly service.